The reason I created this package was that I was unhappy with the editor built into Eclipse. It uses far too much RAM, performs slowly and has poor usability overall. Though there have been recent enhancements including autocomplete features in recent releases, I still dislike how the Demandware Script editor has it's own color settings and doesn't use the theme's settings. Hi! Thank you for this, it would be really useful for me too. The issue is that you can't upload cartridges to your sandbox automatically after saving the file, right? Do you have any solution to this problem? Bogdan, I currently use this package with Eclipse running in the background. 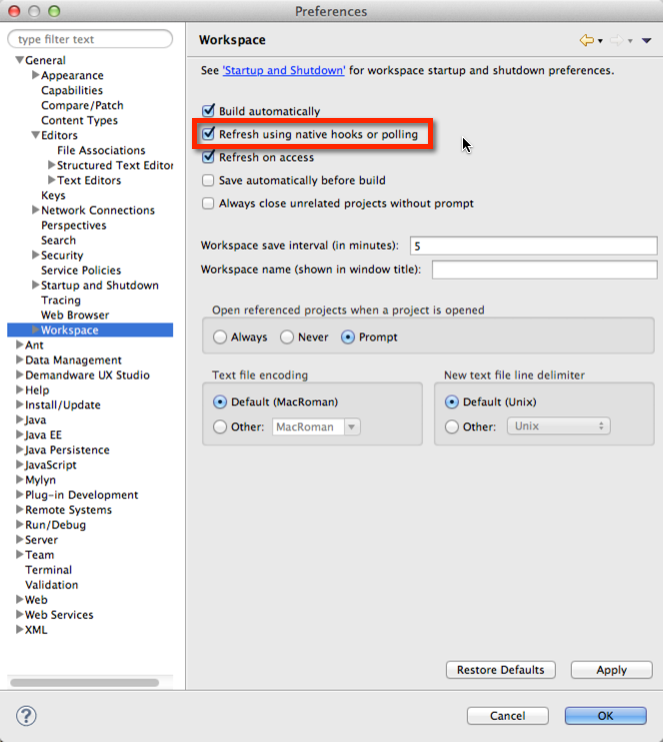 I ensure that the "Refresh using native hooks" option is checked in the Workspace preferences of Eclipse. (see below) I'll look into other options in my free time. I certainly welcome outside contributions to the project.